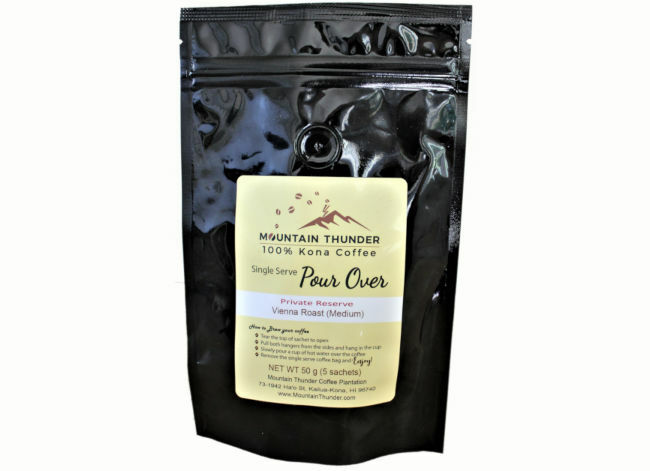 Looking for a great way to enjoy Moutain Thunder's 100% Kona Private Reserve Coffee on the go? All you need is our single-serve pour over sachets and some hot water. The package contains five single serve sachets of our most popular 100% Kona Coffee: our Private Reserve in a Vienna Roast, pre-packaged and ready to make single-serve cups of delicious Kona coffee.